This Italian sausage recipe (salsiccie e fagioli) is a great Tuscan traditional recipe made with stewed beans. 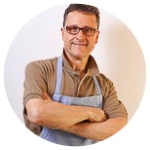 It's a good example of the Italian cook's ability to stretch a modest amount of meat to feed an entire family. 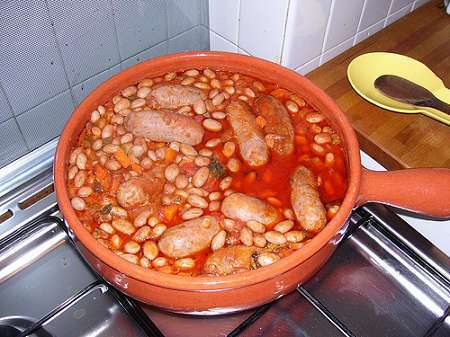 This sausage recipe is cooked together with the beans acting more as a flavoring. Serve this stew with good bread to soak up every drop and stretch the meat even further. In a large skillet, heat the olive oil over medium-high heat. Add the sausage, peeled garlic, and sage and cook, turning occasionally so that the sausages brown evenly. Lower the heat to medium-low, and continue cooking until the sausages are cooked through, about 10 minutes. Drain and discard the fat from the skillet. Add the wine and let it boil until it completely disappears, about 3 minutes. Add the tomatoes and the beans and season with salt and pepper. Simmer for 10 to 15 minutes, adding a touch of water, if necessary to keep the mixture moist.